KIEV, Ukraine -- Russia’s top general Valery Gerasimov has been accused of ‘organising an armed conflict’ in Ukraine which is making plans to put him on trial. Ukrainian authorities hold Gerasimov responsible in particular for a battle last summer around the town of Ilovaysk in which government forces were encircled and suffered heavy losses. "The Shevchenkovsky district court in Kiev has entertained the investigator's request and has issued a resolution on bringing to the courtroom and putting to custody all those who were named earlier at a news briefing - that is, the Chief of the General Staff of the Russian Armed Forces and another ten Russian military," said Anatoliy Matios. Many hundreds are feared to have been killed. “From August 8 to August 23 2014, on Gerasimov’s orders, Ukrainian army positions were systematically attacked with ‘Grad’, ‘Smerch’ and ‘Uragan’ multiple rocket launchers from the territory of the Russian Federation. And this is confirmed by the evidence,” Ukrainian Chief Military Prosecutor Anatoliy Matios told reporters. Ten Russian servicemen have also been put on the ‘wanted list’. Moscow, as always, says all the accusations are unfounded and denies playing any role in the conflict in eastern Ukraine. 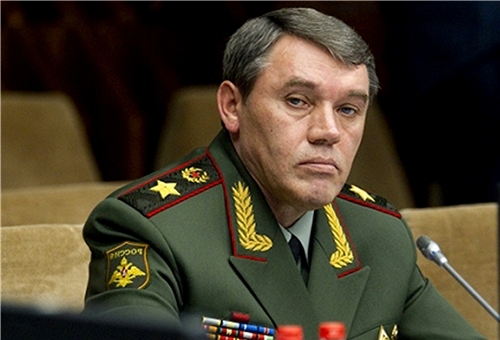 But according to Maria Korenyuk, our correspondent in Kiev: “Ukraine’s General Prosecutor’s Office says it will do everything to start a trial in absentia against General Gerasimov, Russia’s Chief of the Armed Forces General Staff, as soon as possible. “It can be problematic though as there are no precedents for trials in absentia for war crimes in Ukraine,” she said.